"Let all creation help you to praise God. Give yourself the rest you need. the sun and the whole world. of the one who has given them being." 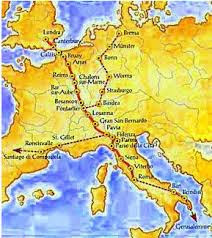 the ancient pilgrim trail to Rome. When does a leap of faith become an act of insanity? However, when does a predictable life of comfort lose its invigorating sense of adventure? These are questions I recently asked myself... but not in that order. As I neared my 60th birthday, my lovely wife, Betsy, offered me a gift of my choosing, since she knew that family commitments would prevent us from traveling together, this time. So, after being inspired by a meaningful movie, called The Way - about an unforgettable hike on Spain's El Camino de Santiago - I chose to backpack along a similarly historic, but less known, pilgrim trail. Via Francigena (pronounced: vee-ah fran-CHEE-jen-ah), is the ancient path to Rome that is documented to have been followed by pilgrims since 725 AD. A thousand years ago, Archbishop Segeric precisely mapped today's entire Via Francigena, beginning in Canterbury England. While that extreme journey can span almost 2,000 kilometers, I was only attempting the last, and most popular, leg of the trail: from Viterbo to Rome. A little reward awaits successful pilgrims at the Vatican. After verifying that at least 100 kilometers of Via Francigena have been completed, on foot, the Vatican's pilgrim office awards a "Testimonium" certificate to each successful pilgrim. It all sounded like a welcome adventure, both intrinsically and extrinsically. But, eventually, my pilgrimage to Rome, like so many before, did not go as planned. in an ancient church in Viterbo. From the beginning, however, I hoped to keep the mindset of a pilgrim: ready for things to go wrong and having to resort to Plan B or C. I knew there would be times I would have to "offer it up" as the rigors of trail life became difficult. Like spiritual exercises, however, I hoped it would put me in the frame of mind that I was simply enduring my little "Way of the Cross," in union with Christ's suffering. Eventually, however, these difficulties came in abundant supply; so much so that, at times, I was resigned to accept this journey as my "Pilgrimage to Purgatory." At one time, I was so desperately trying to find my way back to the trail that I had to hold up a sign to passing traffic: "Help. I am lost." But asking directions, in my broken Italian, did not always produce the results I sought. Oftentimes, people had no idea where the Via Francigena trail was. Once, a man very clearly and confidently told me to go in the opposite direction of where I should have gone. That detour carved out a big chunk of time and effort. But, eventually, I always found angels who got me back on track. My directions might say, for example: "Go softly uphill for 800 meters, then turn right...." That's when my inexperience showed itself. For me, it was more like: "Now carry your 30 pound backpack up a half mile flight of stairs, then turn right." So, by the time I would reach 200 or 300 meters, I was absolutely certain I had found my right turn. I learned to regret my impatience. Yet, even with all the difficulties, I do not want to leave the impression that I regret this pilgrimage. On the contrary, I am still swimming in happy memories that seem almost dream-like, today. This journey was a welcome diversion from my normal activities, and I now chuckle to myself at what I encountered: the good and, especially, the bad. I had plenty of solitude, but was never lonely. Traveling with God -- enjoying His magnificent creation -- how can one be lonely? In my limited experience, I never felt unsafe, regarding attacks from man or beast. I even made friends of some of the animals. Along the trail, however, I was studiously careful to avoid accidental injuries. For example, occasionally, I was routed (or lost) on roads that were dangerous for pedestrians. The cars zooming nearby scared me but, even more, I worried that if I happened to die on this trip, Betsy would kill me! So, I guess that leads me to the fundamental question: "What is a pilgrimage and why should I go on one?" One of the Way's back roads. To me, a pilgrimage is not just a vacation at a religious site. It is not even a retreat. Though pilgrims will offer different definitions, I believe we share one common desire: the quest for spiritual improvement through adversity, on the journey to where God is calling us. A pilgrimage is meant to be a part of the purgative stage of spiritual development about which mystics of the Church have taught. It is where we hope to purge from our lives the habits and possessions that prevent us from growing closer to God. On a pilgrimage, we force ourselves to slow down and listen to God in nature, in ancient churches and, as Matthew Kelly says, in "the classroom of silence." Beautiful Italian nature, in abundance. Yes, a pilgrimage is a leap of faith; trying to be prepared, but ultimately trusting that this difficult journey will be in God's hands. It is like fasting from life's pleasures. Yet, it will be remembered as life intensified. A pilgrimage is a tiny taste of what missionaries and martyrs have endured, persevering through far greater struggles than we will ever face. In 2014, almost a quarter million pilgrims completed Spain's El Camino de Santiago. Via Francigena is not nearly that popular. (On my journey, I saw less than a dozen pilgrims.) But considering that Pope Francis has now declared a Jubilee Year of Mercy, Via Francigena may become a pilgrimage route that many will choose in 2016. I don't want to discourage that pilgrimage, but neither do I want to hide its difficulties and dangers. For example, if my journey through the forest near Sutri had been during a rainy week, I suspect that my passage would have been even more difficult. I cannot speak for Spain's El Camino, but I do know that many of the hilly trails I followed on Via Francigena were significantly more difficult than the ones I saw in the movie, The Way. that the path takes us through. Still, for experienced hikers, that challenge might be welcomed, because beauty is found there, in abundance. Also, on the positive side, other than the Holy Land, what better place is there to go on pilgrimage than Rome? El Camino ends at the tomb of the Apostle James, a destination for Christian remembrance and veneration. Yet, Rome holds the remains of eight apostles, as well as the head of St. John the Baptist. These, and many more, pilgrim sites are detailed in our best selling pilgrim's guidebook, Rome and the Vatican - Guide 4 Pilgrims. Truly, the Eternal City's spiritual and historical treasures seem almost endless. at the end of the pilgrimage. After a pilgrimage on Via Francigena, one will have an even deeper appreciation for all that those apostles endured, as well as the missionaries and martyrs who followed in their footsteps. For them and for us, the difficult journey is all experienced willingly, in union with the unfathomable sacrifice of Our Lord Jesus Christ. Unfortunately, at the end of my trail, I was only able to complete about 65 kilometers. Perhaps, that disappointing defeat will help to improve me, by smoothing the rough edges of my pride, impatience and temper. But I was pleased to attend a general audience with Pope Francis, in Rome afterwards, and I took full advantage of the opportunity to pray at many of the pilgrim sites I find most moving. Now, whenever I pray, those unforgettable memories enhance my union with Christ and His saints. I am glad I went on this journey but, due to a serious but transient injury, I am pleased it is now just a memory. At one point, I truly began to wonder if my leap of faith had become an act of insanity. Yet, visually, there is so much more that I would like to convey. So, on my pilgrimage, the great, the bad, the difficult and the beautiful are shown in a short video I produced, called, Via Francigena: An adventure on Rome's "El Camino". The reader may be wondering how this post fits in a blog about miracles and prophecies. But the most important prophecy for each of us is that if we overcome the obstacles of life, and live in accordance with God's will, we shall spend eternity with Him in Paradise. I wrote that a pilgrimage is the quest for spiritual improvement through adversity, on the journey to where God is calling us. Pilgrimage is a metaphor for life itself. Life itself is a pilgrimage. Hopefully, for each of us, one that is more successful than my pilgrimage on Via Francigena.